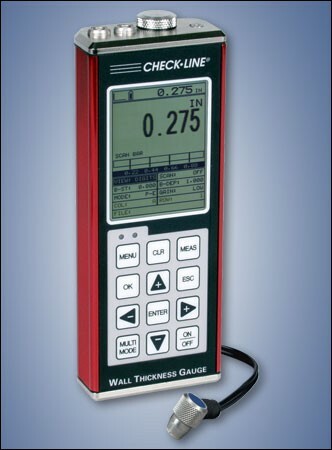 TI-MMX-SDL Datalogging B-Scanning Ultrasonic Wall Thickness Gauge Reliability Direct, Inc. Your Direct Source for Reliability, Maintenance, Test & Measurement! The TI-MMX-SDL is a full featured ultrasonic thickness gauge offering an oversized display as well as a complete alphanumeric datalogging system with storage capacity of thousands of data values. The TI-MMX-SDL features the highest resolution graphic LCD on the market and is especially engineered for optimal ease of use. Use the find feature to locate the detection point, while automatically adjusting the display to bring the signal into view. The TI-MMX-SDL also comes complete with our Windows? PC software for transferring data to and from a PC.